John Wick (Keanu Reeves) has a dead wife and a cool car. That much we can all agree on. The freshly dead wife has sent him a gift posthumously (dear movies: can we stop with the deliveries from beyond the grave now? it creeps me out) – a puppy to help him grieve. Wick’s initially not much of a fan of Daisy, but when he spends the day with her, cruising around in his cool car, they bond. But then something terrible happens: he runs out of gas. And we all know what happens when we stop to pump gas – we run into Russian mobsters. Okay, well, that hardly ever happens to me, but I gas up at Canadian Tire. 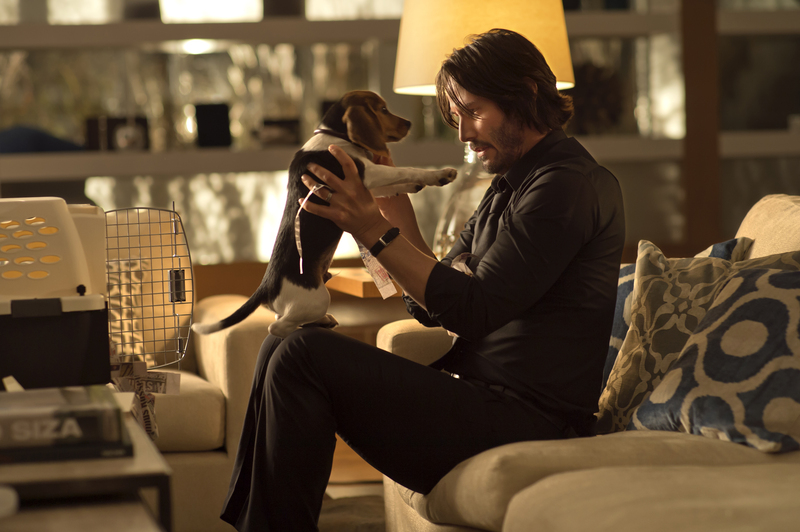 But Keanu stopped at Shell or some such, and so of course his life is threatened when he refuses to sell his car for no apparent reason – and his little dog too. Russian mobsters are infamous for not taking no for an answer, so they follow him home and wage a sneak attack when he’s sleeping to steal his car and kick his dog. Poor Daisy dies in the attack, and that dead dog is the impetus for all that unfolds next. The dog was apparently the last shred of his old life that was holding him together. Turns out he used to be a bad dude, as evidenced by the arsenal he digs up from his basement. He learns that the kid who killed his dog is actually the son of his old boss, head of Russian mob. 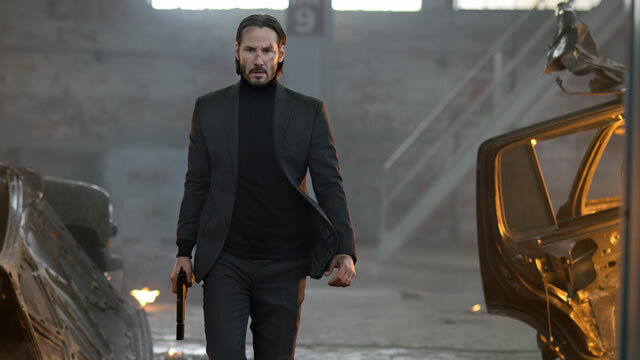 The mob guy learns that John Wick, his most accomplished assassin, is coming out of retirement on behalf of his dead dog, gunning for his only son, and freaks out. There’s a $4 million bounty on John’s head, which he deals with by checking into some sort of hit-man hotel where apparently you’re not allowed to kill people, but that’s assuming that criminals can follow the rules, which we all know they can’t. And that’s where I lost the thread. It’s just pretty much plotless revenge-fuelled action movie after that, constant movement, lots of shattered glass. Body count: 119, 78 by Keanu’s hand. It doesn’t sound like much, and it isn’t, but I’m pretty positive that if you like watching people kill for karma, cash, or just plain bloodlust, you’re going to want to see this movie. This entry was posted in Jay and tagged action movies, Keanu Reeves on January 29, 2015 by Jay. I really liked this movie….when it was called The Punisher 😉 I can’t watch Keanu Reeves and take him seriously. C’mon!! He was Ted “Theodore” Logan! I know! When he’s being “serious” he squints and half-whispers his lines, and it makes me smirk EVERY TIME.